When Will I Get My A7 Envelopes? 5,000 and under A7 Envelopes: Ships or ready for pick up in 2 business days from proof approval. Over 5,000 A7 Envelopes: Ships or ready for pick up in 5 business days from proof approval. Give your invitations and announcements a classic look when they are delivered in printed A7 envelopes from 48HourPrint.com. You get high quality A7 envelope printing that says “class,” but only you know how truly affordable it is. Enjoy the peace of mind of our quality-focused online envelope printing services that give you more for your money. Printed A7 envelopes are perfect for sending traditional-sized invitations for business and social occasions. Use our A7 envelope printing to help your invitation or announcement stand out from the crowd. 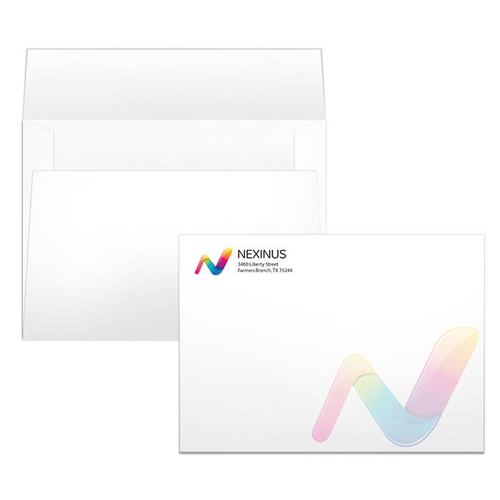 These 5.25” x 7.25” A7 envelopes with your full-color logo, address or special message will attract attention as soon as they arrive. You can also include our A6 envelopes with response cards inside our A7 envelopes or A9 envelopes. In addition to A7 envelope printing, our online envelope printing services include#10 envelopes, #10 window envelopes, #9 envelopes,A2 envelopes, A6 envelopes, A9 envelopes, 9x12 envelopes, and 10x13 envelopes.